Refrigerating bread dough is one of the most convenient ways to store it for an extended period of time. Depending on the composition of your dough and how you’re planning to bake it, you may be able to put it in the oven straight from the fridge, but it’s helpful to set aside some time for rising. According to Purdue University, you may refrigerate standard yeast dough made with water for up to five days, and dough made with milk for up to three days. The dough should be covered tightly with plastic wrap and draped with a kitchen towel to prevent it from drying it. When you’re ready to bake the dough, take it out of its storage container, shape it, let it rise until it has doubled in size and bake it. For a full-sized loaf, you’ll need about an hour and a half of rising time; buns and rolls may require only 30 to 40 minutes. If you perform the dough’s second rise in the refrigerator, you can bake the loaf immediately; however, keep in mind that refrigerator rising takes longer than rising at room temperature. After you shape a loaf, at room temperature, it may need anywhere from 45 minutes to two hours to become puffy and ready-to-bake, but in the refrigerator, it may be four hours or more before the loaf has risen sufficiently to bake. If you’re preparing bread dough with a high percentage of liquid in it, you may be able to bake it sooner after removing it from the fridge. Jeff Hertzberg, M.D., co-author of “Artisan Bread in Five Minutes a Day” and “Healthy Bread in Five Minutes a Day,” champions that a bread dough recipe that uses 30 to 40 percent more water than traditional dough can be refrigerated for up to two weeks and requires only about a 40-minute rise time after refrigeration. When you’re making a type of bread that relies only on “oven spring” to give it a slight rise, you can bake dough directly from the refrigerator. Flatbreads, including naan and pizza, fit this definition. 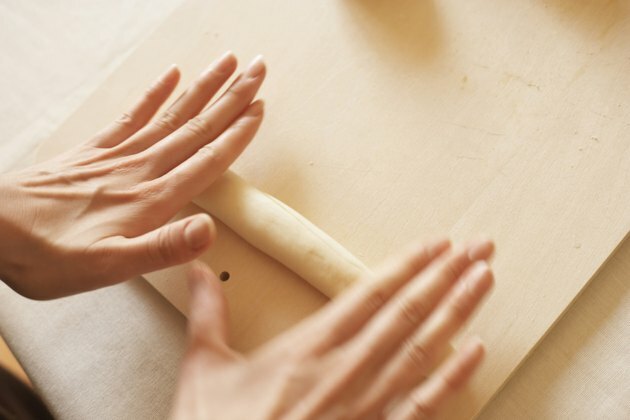 To prepare the dough, simply sprinkle your work surface with flour, roll out the dough with a rolling pin to the thickness you need and bake the bread in a preheated oven on a pizza stone or baking sheet for the time specified in your recipe.